This is your chance to step and make a difference for Mountain Biking where it really counts: building trails! Story Update: Jan 7th 2012 - "Get your Dig On Everyone"
Tony Boone and HM Lim are already in town and scouting the new trail. According to Tony, the new trail will be longer than expected at about 8km. Good news is that the new trailhead for for the Tin Man will be located at the picnic site at the bottom of the road segment that leads up to the Fire Tower. "get your dig on everyone! HM Lim and our great AFCD crew have almost 2km of new trail already flagged...from picnic area to Tin Man below the fire tower....hummmmm that's gonna make the Tin Man very happy.....He'll be much longer, stronger and packed with serious flow....get your All-mountain rides ready for a true blue trail! see below, WE NEED MORE DIGGERS PLEASE!" If you do choose to ride upto the work site to help, please note that to access is it you must pass through the picnic site (see rough map below). The picnic area is not yet open for bikes so the AFCD has kindly offered to store your bikes in their van near the site... and I promise you its no ruse - they WILL return your bike. Here is where the work site is located - note the picnic area (white box in the middle). The yellow line is just a rough, imaginary Tin Man trail that for illustration purposes shows the start and finish points. I am sure the final line will look have many more delighful curves... and dont forget that you are most welcome to pitch in to make a dream come true. We have already had a fantastic response and about 40 HKMBA members have signed up. AFCD informed the HKMBA today that there is still lots of room for anyone interested in joining these workshops. See below for registration details. Another trail in Tai Lam Country Park will soon be legalized. This trail known by many as "Tin Man" or the "Fire Station Trail" is about 5km long and will no doubt be everyone's favorite haunt in the years to come. There is a catch however. The AFCD wants you to help build it. Beginning in January 2012 Tony Boone from IMBA Trail Solutions will return to oversee the trail design and help train local volunteers to assist in building it. Last Spring Tony helped train volunteers and AFCD to build the short beginner trail at Route Twisk. This collective effort proved first hand that building sustainable and fun mountain bike trails in the Country Parks is a real possibility and does not require tens of millions of dollar and the mega-engineering forces of the CEDD to accomplish. It just needs a good sustainable design, simple tools and folks willing to work hard, side by side and grow this sport together, metre by metre. The AFCD has allocated a limited number spots for HKMBA members to join the workshop on one of four days in January. These spots will be allocated on a first come, first serve basis. The HKMBA will collect the names of our volunteers and forward them onto the AFCD by Dec 21st, 2011.
indicate which day(s) you want to help out on and in order of preference so we can ensure all volunteers who are interested can be accommodated. 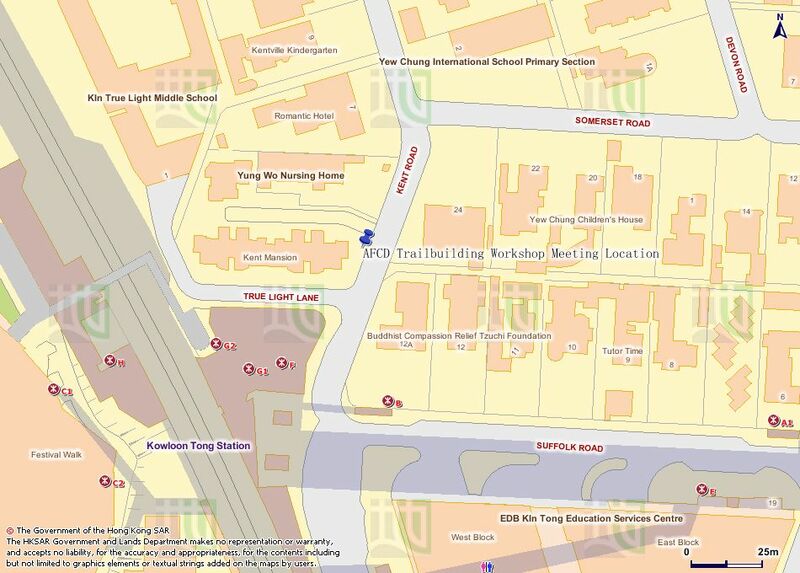 Venue: meet at Route Twisk Management Centre at 9:30am, then we shall depart to Tin Fu Tsai after a short seminar. Food and Drinks: Pack your own lunch and beverages as none will be provided. Clothing: Weather conditions at this time of year can change quickly from bright, warm sunshine and 20C to cold, wet, and windy conditions. Bring footwear that is suitable for hiking and that you dont mind getting muddy or dirty. Also bring some work gloves if you have any. 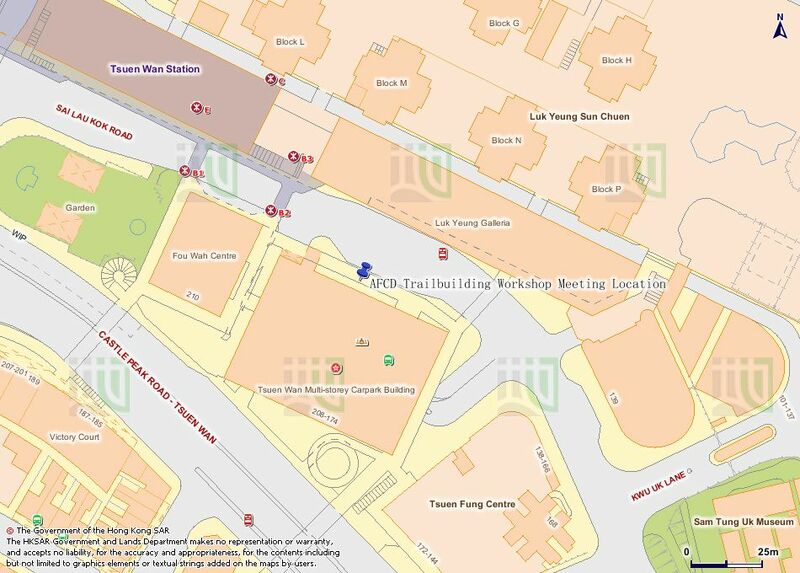 AFCD Bus Transportation: If you cannot make your own way to the AFCD Route Twisk Management Centre, AFCD will supply a 24 seat coach to meet volunteers at the Tsuen Wan and Kowloon Tong MTR stations. Look for the bus marked "AFCD Trailbuilding Workshop"